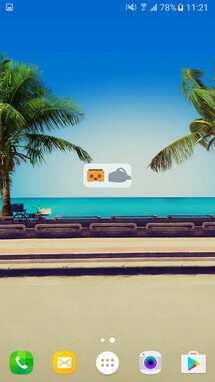 Hecorat, the developer behind some cool apps we love like AZ Screen Recorder and EZ Package Disabler, has released a new app on the Play Store and this one solves an existential problem for all virtual reality fans who own Samsung's Gear VR but also want to try Cardboard apps and games: it lets them do exactly that which Samsung had tried its darndest to forbid. The problem with Gear VR is that the moment you plug your Galaxy phone into the headset, the Oculus app launches and you can't use any other app until you unplug. This means that launching the Cardboard app, or any Cardboard compatible apps and games, is impossible. Well, to be 100% accurate, it was possible before by using Hecorat's EZ Package Disabler and disabling the Oculus app's service auto-start. But that required you to a) know that can be done and b) know how to do it. This new app by Hecorat solves the problem with its super functional name: Use Cardboard apps for Gear VR. That's far from the sexiest app name we've seen on the Play Store, but it serves its purpose well: clearly say what the app can do and make it discoverable for anyone doing that search on the web or in the Play Store. Functional name aside, Use Cardboard apps for Gear VR (that's a mouthful), is simple to use: there's just one toggle and a homescreen widget. 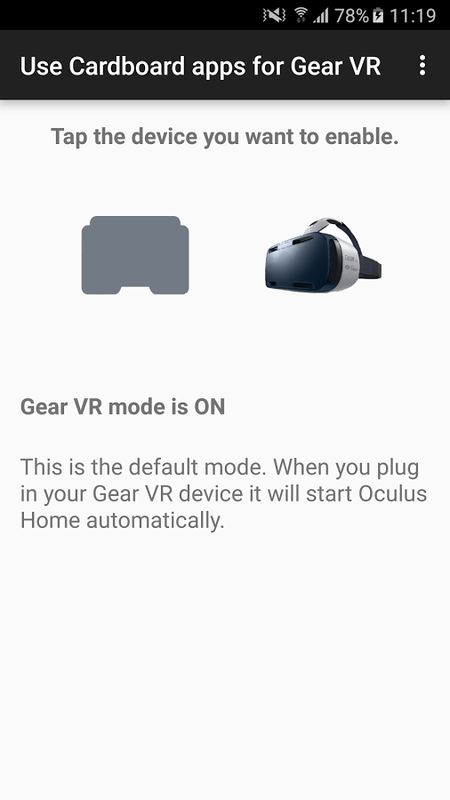 You tap it and it either enables or disables the auto-start service, thus switching between Gear VR mode and Cardboard mode, respectively. 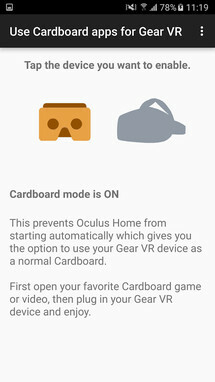 Once you've selected Cardboard for example, you can plug your phone into the Gear VR headset and enjoy YouTube and all the other compatible apps and games. Ah, the sweet taste of forbidden fruit. There are two things worth noting. One, the app acts as a Device Administrator, so you'll need to deactivate it before uninstalling from your apps settings or simply use the in-app Uninstall option which simplifies the process. 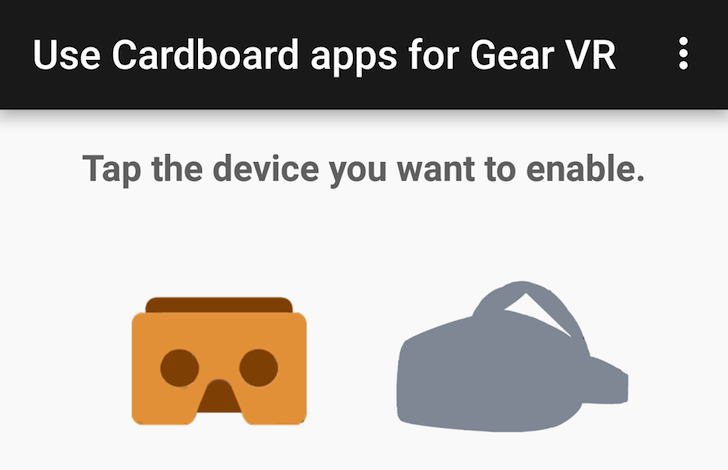 Two, I don't have a Gear VR now so I can't test it, but I'm curious whether there's a way to simulate Cardboard apps' button tap too or whether you'll be limited to apps and games that don't require any tap. Let us know in the comments if you test it. 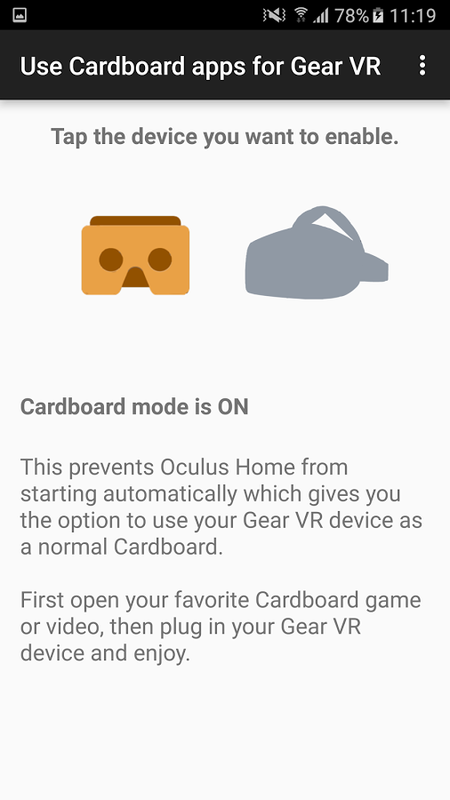 Use Cardboard apps for Gear VR costs $1, which if you ask me, is better than buying a separate Cardboard headset. Besides, there are so few Cardboard headsets with a headband while Gear VR has it and it makes things much more comfortable for long term use.